Red wrigglers to be specific as they are Elyse’s slimy pet of choice. Vermicomposting involves taking leftovers (normally scraps and trash) and having the worms break down the food. This results in a soil like fertilizer. Can you briefly explain the process of vermicomposting? A really close friend was composting in her tiny apartment on the north side. I was pretty much hooked into it by her offering me some worms. She gave me a few tips and I put them in a box in my tiny 1 bedroom apartment closet. A year later I still had those worms and a better appreciation for them. Why did you decide to vermicompost as opposed to other types? Vermicomposting isn’t cheap (initial worms cost) but I found it to have faster results. My compost has gotten better over the years. 3+ years later I find that my fertilizer is more effective and can revive nearly dying plants. We also make attempts to eat healthier. We are organic food junkies and I try to make my compost as organic as possible. How much space do you use in your house to vermicompost and how much space would the average novice gardener need if he/she wanted to start v-composting? I started composting in a storage tote. You can start as small as you want. I just keep in mind that an average month of waste in our home amounts to 3-8 pounds worth of items. These items range from paper towel inserts, shredded paper/newspapers, cooking scraps, dog hair, dryer lint, etc. It may be more depending on if we have guests. You should always start out small and I highly recommend totes (drill holes in top for air). I’ve put my tote in the kitchen, closets, underneath my computer desk. It is really accommodating to apartments. I now have a commercial composter (Worm Factory 360). It is PERFECT for small spaces but could use some improvements. I’ve made minor adjustments to make it more user friendly. How much did it cost to start v-composting? Looking back, do you see any ways you could have saved money starting out? What do you think the average cost would be for a beginner gardener to start a small v-composting bin? My initial cost in composting was $0. I got the worms for free from a friend and I had a spare tote. If you are starting from scratch worms (1000+) can range from $29 and up. My favorite retailer is Uncle Jim’s for my worms. There is usually a coupon available and at least saves you shipping. A standard tote at Walmart can cost $4 and up. If you are interested in composting I would suggest doing a 2-3 collection of items to jumpstart your compost. Peat Moss, lint, and shredded paper are great to start off with. How many worms did you start out with and how many do you have now? I initially started out with a small container of worms (I never counted) and then I added about a 1000 worms to my farm. Unfortunately in the first year of my composting I had to restart after adding spent grains from brewing to my tote. It caused massive overheating (95+ degrees) and about 80% of my worms died. I rehabbed what I could, threw out my compost, restarted with the worms I had plus 5000 more. 2 years later my worm farm is thriving. I don’t know the exact amount but every bin is filled with happy worms. What is the worms’ enclosure like? 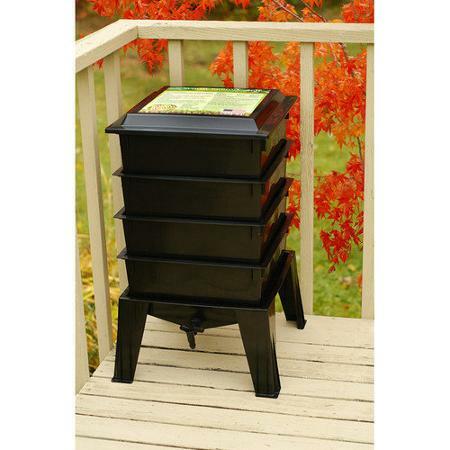 A worm factory 360 has stackable trays. The inside of the trays have holes for them to navigate between bins. The very bottom is a reservoir with a tap handle to capture moisture and the natural “tea” made from the heat in the bin. This is a quick and easy way to get “worm tea” without the brewing process. Are worms demanding pets? Is it difficult to keep them alive? How often do you have to feed them? Do your worms have babies? Worms are demanding in the initial start of composting (2-4 weeks) after not so much. I typically feed them in rotations of 4 weeks with a 2 period “dry” period to encourage them to get their feast on. I collect food for long periods of time then fill the other bins. I don’t want to stack too much at once or the bins will never really be fully composted. I probably should have mentioned early that not all worms are created equal in the compost world. In my compost I use red wigglers (Eisenia foetida). I know that other websites have stated that you can use white worms or earthworms. I personally cannot attest to the success with other worms but I am sure that it works. Some worms are better for hydroponic systems and others are better for composting. Red Wigglers are hermaphroditic (male and female). In all my reading in books it seems that reproduction still happens between two sexually mature worms. You can tell they are sexually mature by the bands (rings) on their tail end. The cocoons are easy to spot. At first I thought I had a termite issue but come to find out it was just worm cocoons! It is amazing to see. The worms themselves don’t have a smell. What they produce does in the rare occasion. If the smell in the bin gets too excessive you may have issues with the composting items. What do you feed your worms and what are some things you should never feed a worm? In the past year I’ve spent more time trying to have an organic compost. This is easier said than done (thanks wallet). My normal compost consists of food scraps (banana peels, outside of apples, spoiled leafy greens), shredded paper, and spent grains from our home brewing. I would never feed my worms anything too acidic (though they WILL eat apples) onions, meat or dairy. Can you briefly describe the process of making your composting tea? This past year I’ve experimented with this to the best of my ability. I would like to credit the Pennsylvania Department of Environmental Protection for my process because I use the one on their website! Why do you turn your soil into gardening tea? What are the benefits and who should do likewise? I cannot back up my gardening tea as scientifically solid. I can say that it has made my garden better! Other online composters will swear by it as well. I know that I use mine as a spray to protect the leaves against insects. I also use it to water the soil directly. The soil in our yard is hard clay. This year we will be investing into other ways to supplement our lack of soil. I can’t produce enough fertilizer to actually grow but I do like to use it to “jump start” our seeding. How has v-composting impacted your lifestyle? I believe that composting has made me more mindful of the waste I produce. Any advice for people considering v-composting? DO IT! Don’t get freaked out by the worms. They will not crawl out and hunt you down in your house. Research before you invest. It is a commitment and I take it seriously. What do you see as the future of your v-composting? I’m hoping to branch out and do community composting. You hear about it all the time in other states that have communities that take pride in urban homesteading. I would like to start with my own neighborhood and have a collection base at my home. In return for waste residents can come and buy back the fertilizer at little to no cost. I would also like to branch out and do larger scale composting or try out a hydroponics set up. What are you currently growing in your garden? Weeds! HAHA Right now nothing is growing but we will begin prepping for it after we begin our bee hive set up! Do you see a noticeable difference in plant health and crop yield from using your composting tea? I notice that the leaves are not eaten up or frail. It may be a bug repellent (not sure) but a lot of my plants look healthier and some will yield more. We had a fantastic pepper harvest 2 seasons ago and this past we just struggled with weather and soil issues. Any general gardening advice for first time gardeners? Start small. The first items I ever grew were herbs. Potatoes, herbs, and leafy greens are a starting gardener’s best friend! I hope all my readers enjoyed this interview as much as I did! As always, Elyse never fails to educate and inspire and if you are as excited about worms as we are maybe you’ll pick up a few thousand and start your own worm farm. … I wonder if worms qualify as an acceptable “pet” on my apartment lease…. Why is she the vermiqueen? Because her experience and crazy experiments in the world of worms makes her the expert! Hoping for a come back of that sweet Vermiqueen Tea for retail in the Indianapolis area this summer? Follow my blog, More Than Mommy, and you’ll be the first to know! < Previous Garlic Baby Update! Next > Compost Here We Come! Vermicomposting got to love the worms! Thanks for the reblog. Can’t wait to check out your blog! Not a problem! Thanks for reading!! Thanks Katie, and thanks Elyse! That was a great read. I’ve had a worm bin for a little over a year (love it, absolutely love it) and had never heard that they didn’t care for potato peels. It so happens that I was just ready to feed my guys a batch of potato peels, so I’ll amend that menu to coffee grounds and banana peels today. I’m glad you enjoyed it! I’ve known for years that Elyse did vermicomposting and brews her own (as I call it) worm-poo tea 😉 but I really learned a lot from this interview! Maybe when my own little critter isn’t so demanding I can start my own worm bin.